79% of marketing leads never convert to sales. 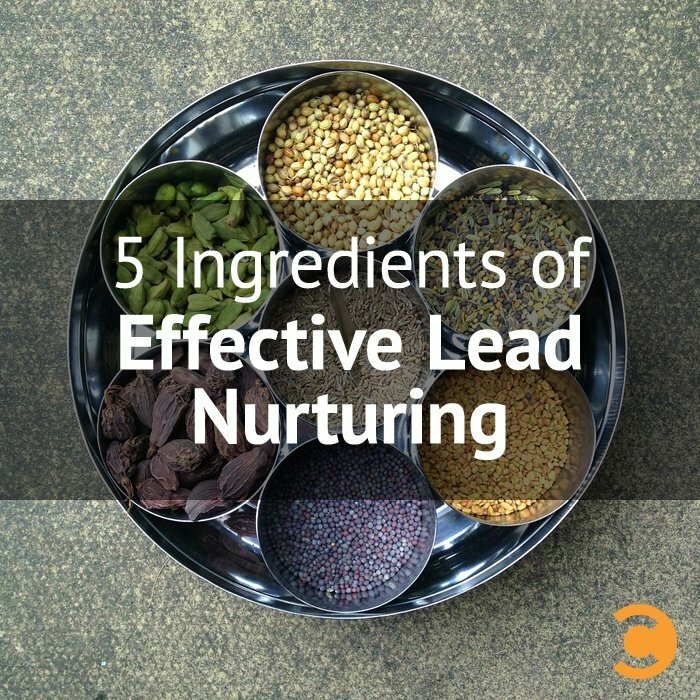 Lack of lead nurturing is the common cause for poor performance (MarketingSherpa). Companies that excel at lead nurturing generate 50% more sales ready leads at a 33% lower cost (Marketo). Nurtured leads makes 47% larger purchases than non-nurtured leads (The Annuitas Group). But how do you make sure your lead nurturing efforts are actually engaging your audience? Every successful lead nurturing piece shares five characteristics that make it stand out and connect with your audience. Today’s customers are very savvy when it comes to unsubscribe processes, blocking online ads, and “Promotional” Gmail tabs. The social web has changed how brands communicate, and buyers are increasingly wary of overt, outbound marketing efforts. Create trust by offering a variety of levels for leads to opt into, clearly outlining the goals and setting expectations, and then delivering exactly what you’ve promised. Buyers respond to brands they trust. Who is your audience? What do they want from you, and when? How are you improving? If you don’t know the answers to these questions, ask. Getting input from your customers via a survey, a free site or process analysis, or a live Q&A session can yield loads of relevant intelligence. You can also use social media and industry forums to scan for questions and listen for popular topics. Categorize your leads via their needs, education level, position in the buying lifecycle, and/or industry. Creating robust personas can help you nurture leads with increasingly customized campaigns. Personalized, value-filled campaigns that speak in an authentic voice are essential. Part of this is defining and adhering to a strict brand voice across all of your communications. The other side to conversational communication is remembering that your leads are people, not just email addresses. Personalize your messages by speaking to each lead about his industry, his pain point, his stage in the buying cycle, etc. Personalization may sound like a lot of work, but the right marketing automation platform can make it simple and scalable. Is your email marketing robust, while your social presence is on life support? Customers transition from email to website to social channels quickly. Every communication and presence needs to be unified in message and aesthetic. Be instantly recognizable everywhere with consistent, updated branding . Mobile-friendly marketing is becoming more and more important. It’s been a year since mobile internet access overtook PC access, which means that statistically, your buyers are viewing your messages on phones or tablets. How do your emails and website look on mobile devices? How efficient and easy is interaction? Depending on your answer, an update may be in order. Demonstrate (and quantify) your efforts. Your lead nurturing efforts should make an impact that you can measure, and not just with vague terms. For the truly skeptical—or just plain analytical—hard numbers can help. Detail what what was done, how often, and what the results were over a clearly defined period of time. Using bulletproof demonstrations of ROI can convert even the most suspicious. In a buyer-driven market, with tomes of information and reviews at everyone’s fingertips, the buying cycle is shifting and, in many cases, elongating. At Marketo, we have found that some buyer lifecycles can last longer than two years. However long or short your average buyer’s journey, lead nurturing is essential to keep them familiar with your brand and moving through their buying journey. Savvy marketers are turning to content in droves to achieve those goals, but many are still looking for a way to fine-tune their process. Make these five characteristics shine through every level of your content, and your brand will be way ahead of the game. Ellen Gomes is a Content Marketing Specialist at Marketo. She’s a news junkie and loves to stay up to date on the latest marketing trends and connect with new people over social media. In her free time she frequents food blogs and caters to her very spoiled orange cat.